They might not win any gourmet awards, but the line out the door on Friday night says you’re onto something good at Lyall Bay's Seaview Takeaways. They might not win any gourmet awards, but the line out the door on Friday night says you’re onto something good at Lyall Bay's Seaview Takeaways. With prime beach-front location, Seaview is a hit not only with local regulars, but also with those venturing from further afield determined to enjoy fish and chips on the beach. A perfect on-the-beach option, especially after a swim, or hastily consumed while enjoying the sea view from the comfort of your car. 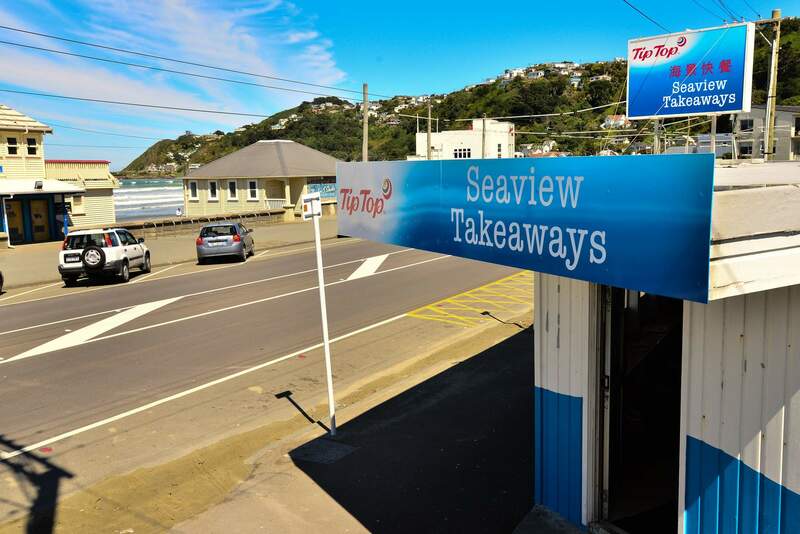 Seaview Takeaways has an extensive traditional kiwi fish and chip shop style menu – think hot dogs, fish, chips, potato fritters, and burgers – as well as noteworthy additions such as dumplings and sweet and sour pork. Their fries are hand cut on site. Packaged in the traditional fish and chip shop burger bag, the burgers are unpretentious and delicious, not to mention ridiculously cheap at around $5 a pop. The Hawaiian burger with bacon and pineapple is highly recommended. Bonus points for ease of eating – the filling doesn’t fall out, which is of the utmost importance at the end of the week when you ‘just can’t even’. As it’s within sight of the sea, togs are acceptable attire. As are pyjamas, apparently. The service is friendly and efficient. Regulars are on first-name basis with the staff, and their orders seem to be processed slightly faster than others. Or maybe we were just hangry. Nothing a scoop or ten of Tip Top ice cream won’t fix.